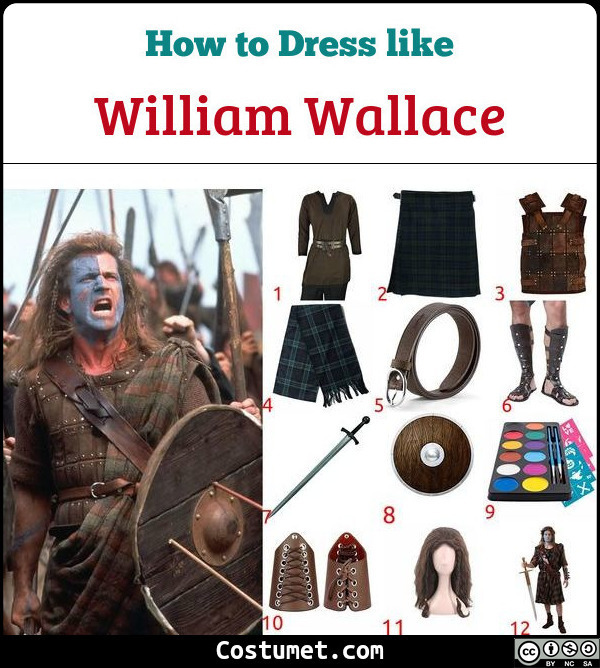 Being a highlander warrior, William Wallace's costume and props reflect both accounts. He wears a brown T-shirt, a kilt and a matching sash, a leather armor, and gladiator shoes. Wallace is also equipped with a sword and wooden shield. If you want to recreate this look, checkout our item list down below! 1 Brown Tunic Find a plain dark brown tunic to wear. 2 Dark Green Kilt Match the tunic with a dark green Scottish kilt. 3 Full Body Brown Armor Top your shirt with a full body armor. 4 Dark Green Sash Wear a sash over the armor. 5 Leather Belt Fasten a belt over a sash and armor. 6 Gladiator Shoes Match your outfit with a pair of gladiator shoes. 7 Sword Prop Look for a long sword prop to carry. 8 Wooden Shield Prop Also find a wooden shield prop to carry. 9 Facial Painting Colors Get a face paint in white and blue. Then paint half of your face blue, and the other white. Also paint some blue on your arms. 10 Leather Armbands Find brown leather armbands to wear. 11 Brown Frizzy Wig Recreate a warrior's hair with a frizzy dark brown wig with medium length. 12 Full Costume Get a full costume now if you don't have time to collect each item. William Wallace, famously played by Mel Gibson, is the protagonist in the 1995 Hollywood war film, Braveheart. The film tells the story of Sir William Wallace, a Scottish knight who becomes one of the main leaders during the First War of Scottish Independence against England. It is not only the love for the nation that drives him to the war, but also the grudge towards an English soldier for executing his secret bride after she assaulted them. The film received a lot of popularity and became iconic over time. John Smith wears a blue trilby hat, light blue shirt with Victorian corset vest, blue pants, and dark blue pirate boots. John also seems to always carry a blue cross body bag with him. Zorro is most known for his all-black ensemble. He wears a black tunic, black pants, black boots, a billowing black cape, a black Spanish hat, and a black mask.